For enabling the outside-of-cell activity of the recombinant LuxI enzyme which will serve as the signal transducing element in our system we needed to provide the substrates for it: S-adenosyl-methionine (SAM); which also serves as a universal donor in methylation reactions and is easy to get from the store and acylated-acyl carrier protein (in our case hexanoyl-ACP); which is not readily available commercially but is possible to synthesize by more available strategies. The synthesis and detection of this compound is discussed further. There are two major quorum signaling molecules produced by the V. fischeri LuxI enzyme in almost equimolar concentrations: N-(3-oxohexanoyl) homoserine lactone and hexanoyl homoserine lactone (1). The two compounds differ only by a keto group at the third carbon of the acyl chain, but hexanoyl homoserine lactone was used since it was advantageous to try synthesizing it using commercially available products. Normally the in vivo synthesis of the acyl-ACP substrate for the production of signaling molecules in bacterial quorum sensing is carried out by enzymes like acyl-ACP synthetases which can transfer fatty acid groups onto the functional ACPs (already containing the phosphopantetheine prosthetic group). The two-step purification of the V. fischeri LuxI enzyme and in vitro ACP acylation reactions have been achieved before (2). We, however, decided to try an entirely different synthesis approach by using a different enzyme, namely ACP synthase (4-phosphopantetheinyl-transferase) which is involved in a more general reaction that spans all the domains of life and represents the addition of a prosthetic group to an ACP protein either from the fatty acid or polyketide synthesis pathways in order to make it functional. The prosthetic group in this case is a phosphopantetheine which is taken directly from CoA and added to the apo-protein variant of ACP generating adenosine 3',5'-bisphosphate and holo-ACP (reaction depicted on the right side). If we substitute in the reaction above CoA with derivatives containing the acyl group already attached to the phosphopantetheine moiety, then we would be able to produce hexanoyl-ACP (figure on the right) ready to be used directly for the in vitro reaction with LuxI. The behavior of the ACP synthase depending on the CoA and apo-ACP substrates is illustrated in the figure below. 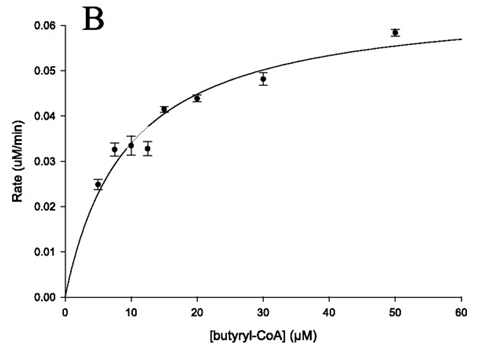 As a successful example from literature to support our experimental design, the Km value for butyryl production (figure on the right) from the respective substrates by this strategy was about 8.1 µM which is close to the value of non-derivatized CoA substrate. The turnover number however was 5 times lower than for CoA (0.2 s-1 compared to 1.0 s-1) which could be overcome by longer incubation times. Although this approach isn’t quantitative, it would give a hint about the efficiency of the reaction. An intermediary step for the detection of the acyl-ACP synthesis is the incubation of the reaction mixture with cell extracts of strains constitutively expressing LuxI. Using as a control LuxI extract incubated with SAM, a receiver strain and no reaction mixture, normalization is possible and the relation of fluorescence to varying amounts of the provided reaction mix containing hexanoyl-ACP can be tracked. Quantification can be done to assess the maximally efficient conditions for acyl-ACP synthesis. A next integrating approach is to test our system with that of the “Fusion protein”. 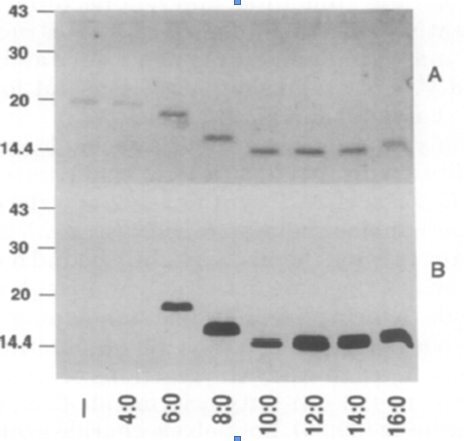 If we test our AHL-sensitive reporter cells again with SAM, hexanoyl-ACP containing reaction mixture and the recombinant LuxI, then the activation of the reporter cells by this reaction mixture proves the fact that we have produced both functional acyl-ACP and preserved the AHL producing function of the fusion protein (in-vitro activity proved). The reaction components and their molar ratios were adjusted based on previous studies (4,5) and are as follows: 50 mM Tris-HCl, ph 8.0 buffer, 10 mM MgCl2 (enzyme cofactor), 1 mM DTT, 300 µM CoA, 50 µM of apo-ACP and 5 µM of ACP synthase in a total of 100µl reaction volume. The mix is incubated at 37°C for 30 minutes. For terminating the reaction, 50 mM EDTA or 10% trichloroacetic acid is added.